Cal here with Tuesday Stretch as we continue to get used to writing and saying 2018. 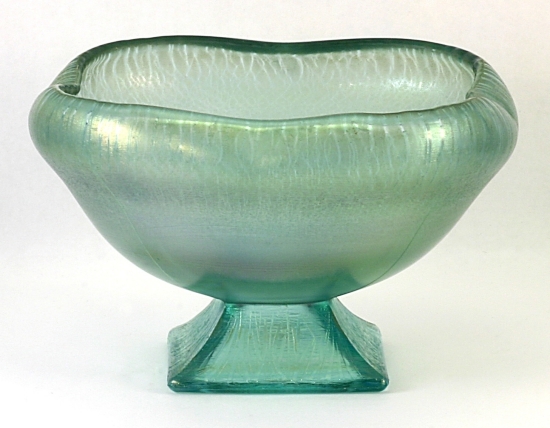 Thanks to Tom Monoski’s eagle eye I was able to acquire a Northwood wide cupped Comport with the 12-sided “tree bark or “tree of life” foot in Topaz stretch glass as my first purchase in 2018. 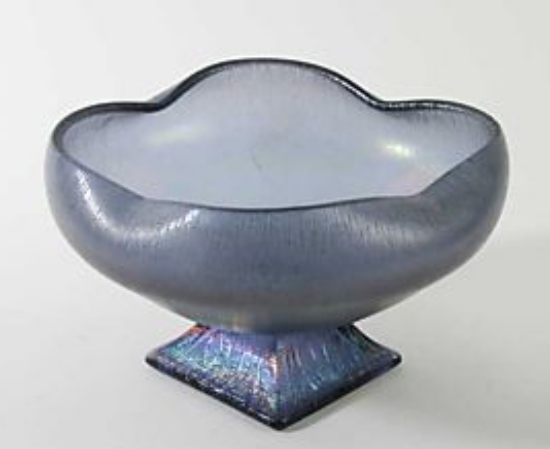 I had a pair of the same comports in blue, but the Topaz one had been alluding me. 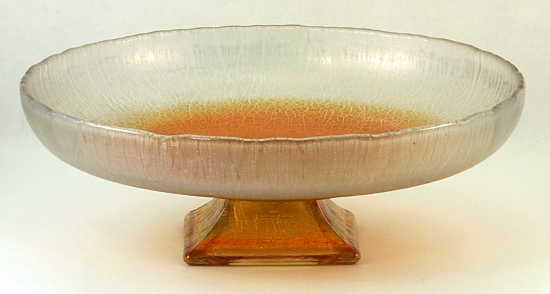 These comports sometimes are marked with the Northwood “N” mark and on a few occasions, they are marked twice with “N” mark, once on the bowl of the comport and again on the inside of the base. Marked or not, they are a useful and attractive piece of stretch glass. Northwood made an extensive line of stretch glass with tree bark bases. The bases can be 4-sided, 8-sided or 12-sided. Generally the smaller bases are under the smaller comports. 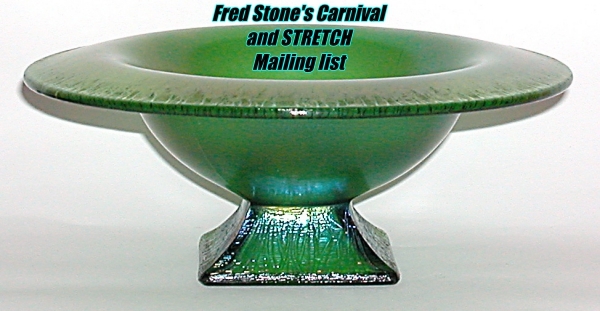 The smaller comports, which are often referred to as footed bowls, are known in a wide array of colors including light blue green, Blue, dark blue, dark (or emerald) green, Topaz, Royal Purple, marigold, Pearl and Russet. There may be more colors out there, but those are the ones I am familiar with and can attest as having been made for sure. I don’t want you to think that I am schizophrenic with my capitalization – there is a method to my madness. If the color name is capitalized, it is a color name found in Northwood catalogs, trade journals or other authoritative sources; if it is in lower case, it is a color name used by researchers (in this case, usually Shetlar or Madeley) to denote a particular color or shade of color. Let’s take a look at some of these tree bark base items. 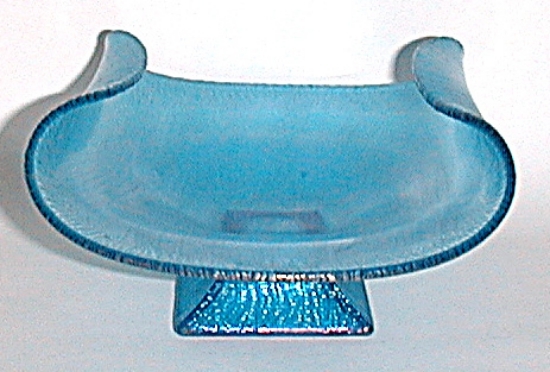 The comports on 4-sided bases were made in a variety of shapes, but all from the same mold. Interestingly, Northwood used different item #s for these to differentiate the shape. And we know of at least one shape for which we have yet to find an item #. The #807, cupped, crimped comport is really not crimped at all; that is there is no indication of a crimping tool being used on the glass. It is simply worked into a square-ish shape and then in the middle of each side of the top of the comport the glass is pulled in slightly. The #807 is also used for the same comport with a round, cupped top and a round flared top. 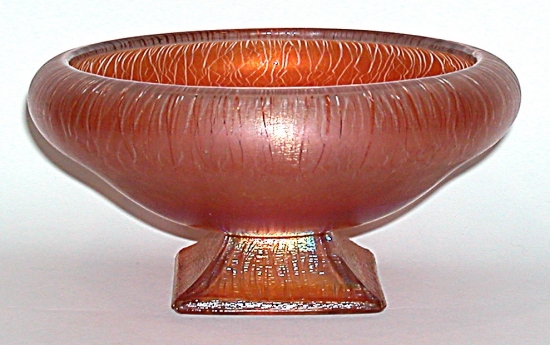 A similar comport exists which is more like a rose bowl, in that it is ball-like in shape. 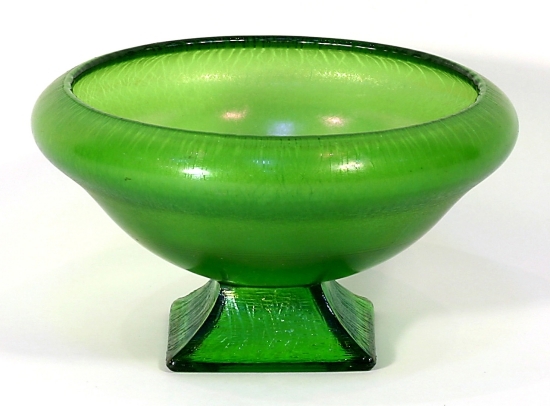 This comport doesn’t have a # associated with it. 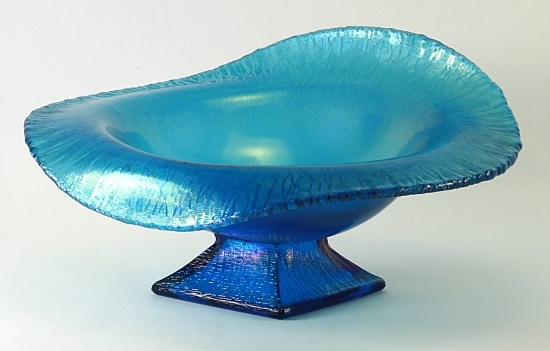 I think of this one as a small version of a fish bowl, but of course it is way too small for fish! 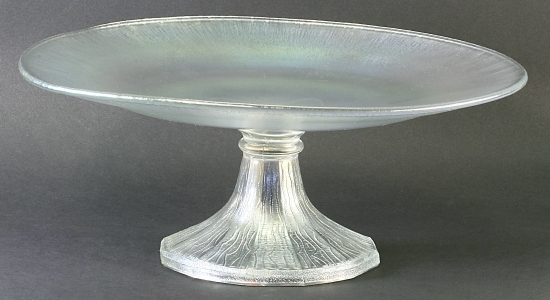 The #605 was assigned to the comport finished with a Jack-in-the-Pulpit top as well as the one which is wide flared with 2 sides cupped (often referred to as the banana dish) and an “open” wide flared version. 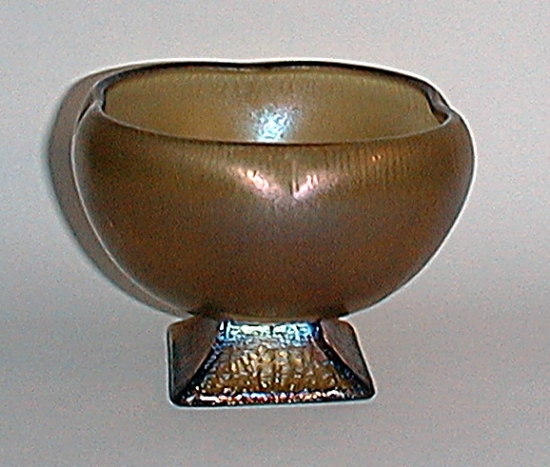 Most shapes are available in most colors with the exception of the wide flared, 2 sides cupped version. 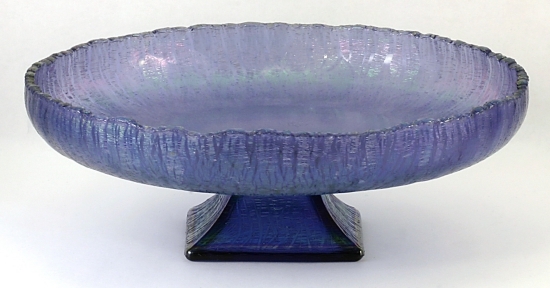 This is typically found in Royal Purple, Crystal or Blue; other colors would be considered hard to find. 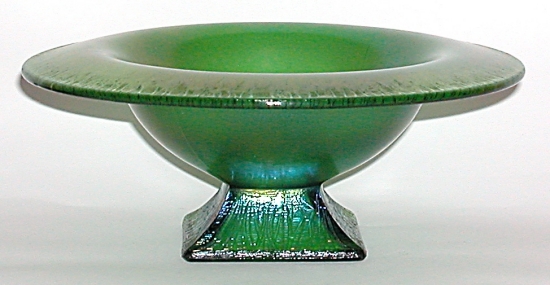 Interestingly, Russet is a tough color to find in these comports as is dark/emerald green. 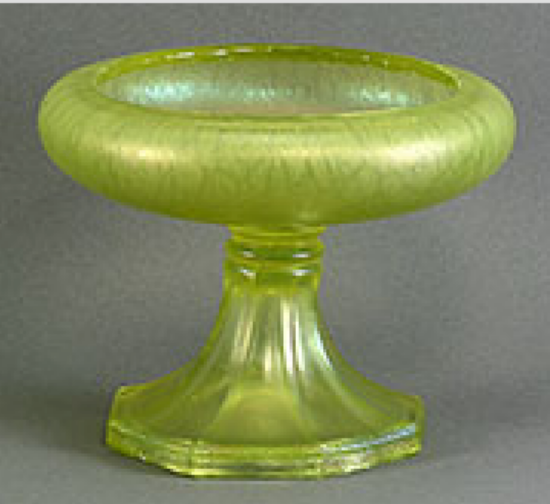 Comports, in the more traditional sense, with pedestal bases were made with both the 8-sided and 12-sided base. The smaller ones have the 8-sided base and the larger ones have the 12-sided base. 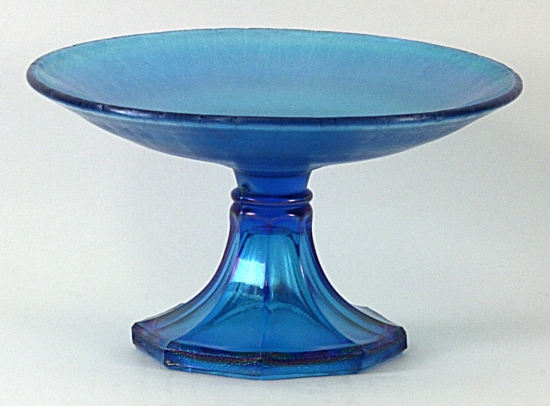 In both cases, these comports are found in one of three shapes: wide cupped, wide flared or flattened into a cake stand in the case of the larger one and a bon bon in the smaller size. These are typically found in Blue and Topaz with a few showing up in marigold (usually the marigold ones are flattened into a cake stand) and crystal. 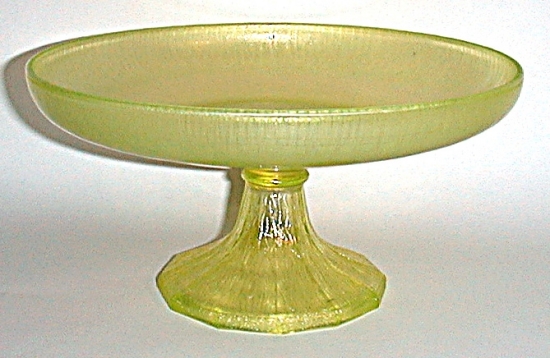 There is a large cupped comport known in custard glass with marigold iridescence. 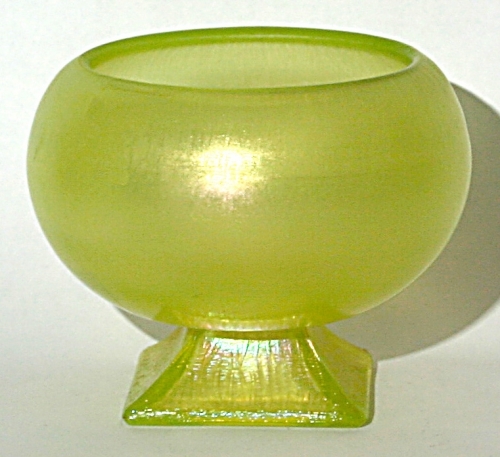 Once again, as with much glass, one can create a collection within a collection by acquiring one of each size and shape in each color.